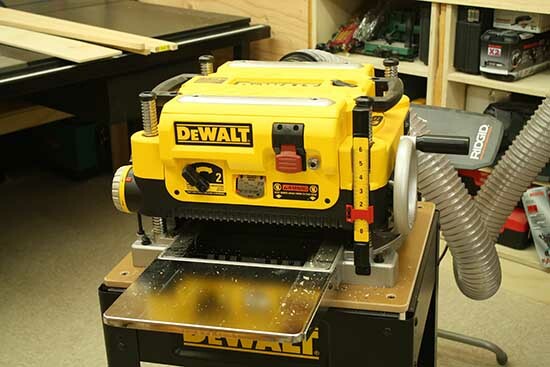 DEWALT DW735X Review - 13" Thickness Planer - Best in Class! 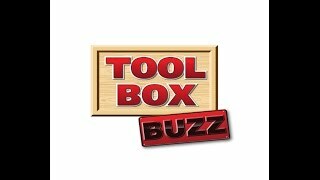 When choosing shop machinery for my new wood shop one of my biggest constraints has been choosing equipment large enough to handle decent size projects yet small enough to fit into a medium size shop. The selection of a thickness planer basically comes down to two size categories; small portable (albeit real heavy to be portable! ), or very large stand alone machines. The stand alone machines are far too large for my shop so I was left searching the 13″ planer category. It didn’t take me long to zero in on one particular planer and that was the DEWALT DW735. 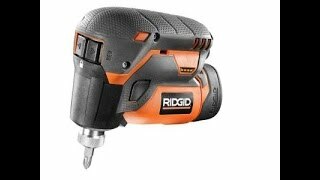 After reading several reviews it was clear to me that this was a hidden jewel among the DEWALT product lineup. 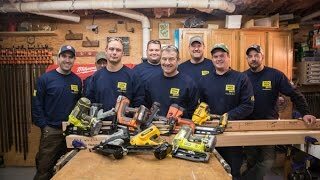 Below are some of the key spec’s on this tool and my take on this super-charged thickness planer from DEWALT. Before I even ran a piece of wood through this planer I was impressed. Out of the box the unit is very heavy and clearly a heavy duty machine. The DW735 is so easy to setup that even a complete novice to thickness planing can set it up in a mater of minutes. It comes with the blades already installed and all the pre-set stops factory adjusted. To start you simply insert about an inch of the board you want to plane into the end of the planer and lower to cutter head down onto the board. Next you pull out the board and lower the head as much as you’d like to take off the first cut. Turn the machine on and watch it do it’s magic, it’s as simple as that! It’s so simple to setup that I honestly figured I’d just gotten lucky, however, I quickly learned the DW735 is just that easy to setup. Even more impressive is how smooth the controls operate. The cutter heads are raised and lowered with a very smooth turning handle on one side of the unit. For each full rotation of the handle the cutter heads raise or lower 1/16″. This is nice because it makes matching another previously milled pieces thickness. The picture above shows the chain that’s used for raise and lower the cutter heads. 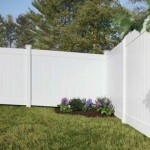 The chain drive speaks volumes to the quality and durability of this unit. There are two gauges on the DW735 and they are both easy to read and use. 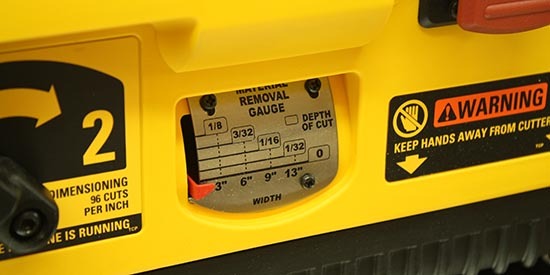 The removal gauge shown above shows how much thickness will be removed but it also offers a handy chart suggesting the maximum to remove per pass based on the width of the board. The thickness gauge shown on the right shows the total final thickness that the board will be after passing through the planer. The thickness gauge was spot on straight out of the box. It can easily be adjusted if necessary by loosening two screws and moving the red gauge marker. This gauge really is just a visual reminder of how thick the piece is. For repetitive planing of multiple pieces to a set maximum thickness the user can use the Turret Stop located on the left side of the unit. The Turret Stop has pre-set thicknesses of: 1/8″, 1/4″, 1/2″, 3/4″, 1″ and 1-1/4″. This is a great feature when trying to plane lots of boards to the same final thickness. Power is tough to describe in words. 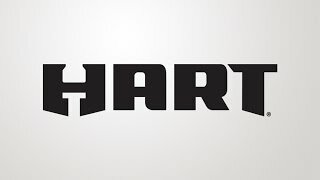 Soon I’ll also create a video review for this tool so you can see first hand what I mean about power!. I recently purchased some 8/4 Maple, Purple Heart and Walnut for cutting boards. The boards were about 10 inches wide. I was blown away as I started my first pass at 1/16″ and the planer didn’t even moan. Board after board the DW735 chewed through layer after layer of wood with ease. The one thing I was most concerned about with this small planner was dust and chip collection. I’ve got a pretty robust dust collection system in my shop, however the amount of dust and chips that a planer produce gave me reason for concern. The DW735 has a built-in chip blower mounted at the rear of the unit. It helps push chips out from the unit and into the dust collection pipe. 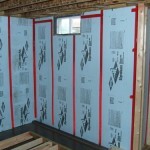 This combined with the dust collector creates a system that works exceptionally well. 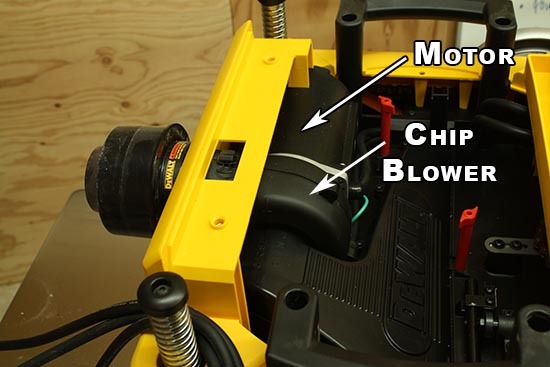 If you look at the photo above you’ll see that they have connected a chip blower directly to the motor. There is a shroud over the blades which connects to the chip blower. This system works so well that when I removed the cover on the planer there was virtually NO dust inside even after running over a 100 feet of hardwood through the planer already. 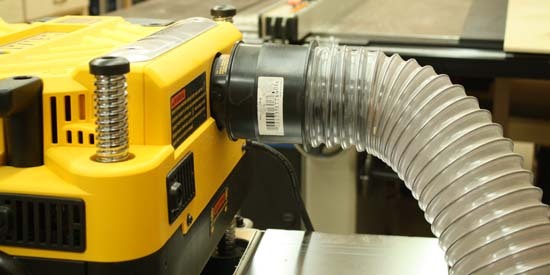 The dust port is located at the rear of the unit above the outfeed opening of the planer. The location of the dust port is one of the very few complaints I have about the DW735. Because the hose enters the rear of the unit it sits directly above boards coming out the finished end of the planer. This means you’ve have to keep the hose lifted up and out of the way so the exiting board doesn’t run into the hose. This is a minor issue but one I’d like to see addressed in the next model. The dust and chip collection work flawlessly on the DW735. Each time I’ve used the DW735 I’ve been able to capture all of the chips and dust. 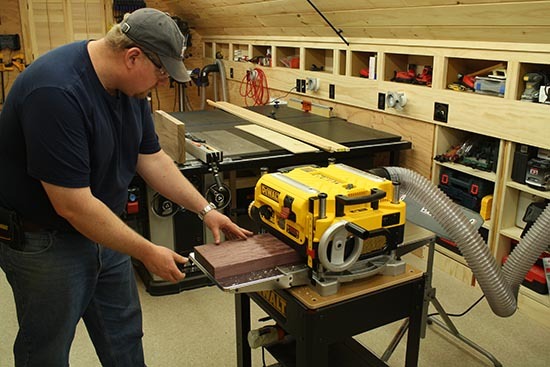 Planing is one of the tasks in the woodshop that creates the most volume of chips and dust. Because of the built-in booster this planer is able to easily capture all the dust regardless of cut depth and board width. The cutter head uses three blades that are really easy to change. 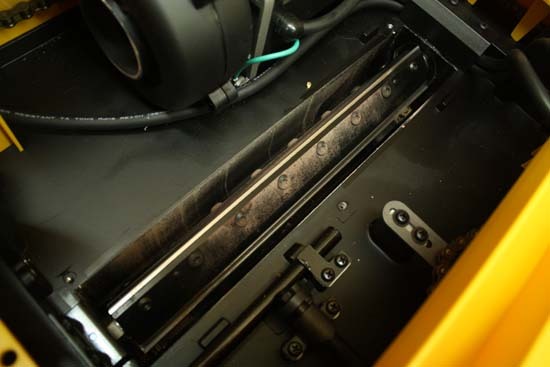 One Allen wrench is used to remove the top planer cover, dust cover and the blade bolts. Changing the blades literally only takes about 15 minutes and I found it to be really easy. In the image above you can see one of the blades and the bolts that hold it in place. The DW735X model comes with some extras that the DW735 does not. You get an extra set of blades and you get the two support wings that easily attach to the front and rear for added material support. Both of these are great add-ons and worth the added cost. 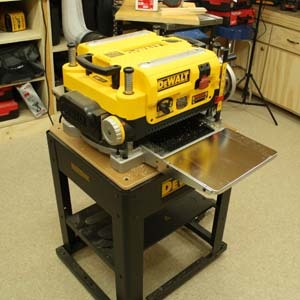 I also have the DW7350 – Mobile Thickness Planer Stand. The stand is also built from high quality materials and rivals any of the mobile stands I own. 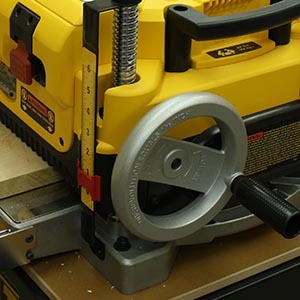 In fact, if you’re going to put this on a stand I recommend you buy the DEWALT version compared to an after-market version. DEWALT makes lots of great tools and I seldom find issues with any of them. 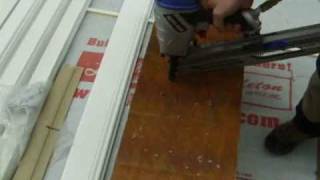 In this situation they have an AMAZING tool with the DW735 Thickness Planer. 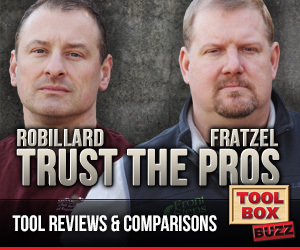 In fact, I would say it’s one of the best overall performing tools that I’ve ever reviewed. Over the last few months I’ve planed all kinds of wood from soft pine to hard maple, purple heart and even walnut. Each time I’ve planed the material the finish is so smooth it hardly even needs to be sanded. The ease in setting up and planing pieces of wood is incredibly impressive. 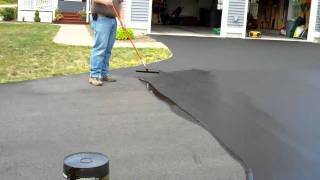 Combine all that with a very well built product and you have a tool that I would recommend to anyone. One of the biggest complaints with smaller planers this size is snipe. I’ve planed well over 100 lineal feet of material and I have yet to find any snipe at all. 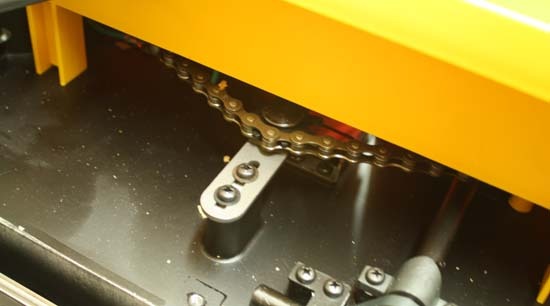 The automatic carriage stop feature clearly solves this long standing design issue for planers. 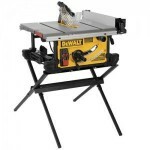 I can only hope that DEWALT continues offering this great product for many years to come. This is a great little planer. Better than my personal DW734…though I’ve put this bugger through just about everything I shouldn’t, and it’s going strong! 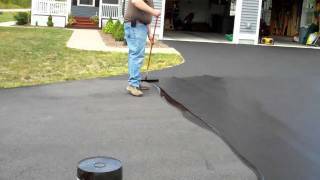 Bob – It truly is an awesome planer. At first glance you certainly wouldn’t know it! As a long time owner of this planer I agree with everything that you said about it. I do however feel that you overlooked it’s one real weakness, it’s blades. I have nicked the Dewalt blades on PINE! This results in ridges on the boards that need to be sanded. I have had much better results with aftermarket blades. Thanks John – I’ve had mine for years and knock on wood no issues yet. What blades have you had the best luck with?